I had the opportunity to meet and speak with Elisa Bates, the director of the short film AWAY, which featured an all-female surf cast from Rockaway, NY at the opening party of the NY Surf Film Festival on September 18th. Naturally, I had a lot of questions and Elisa was very willing to answer them all. I picked her brain about her inspiration for the film and what we can expect next from her. I grew up in the suburbs of New York City, went to undergrad in upstate New York, and have been living in NYC (first Manhattan and now Brooklyn) for more than 20 years. I’m an art director and designer who’s had a diverse career but I’d say the bulk of it was spent working in the music and entertainment industry, at two major records labels and at a cable TV network. I had never studied design at school and so a few years ago decided to apply to the MFA Design program at The School of Visual Arts and got in. It was an incredible, life-changing, unforgettable experience that was so much more than I bargained for. And my thesis project ended up being my short film, “Away.” I graduated in May and spent the summer promoting my film and doing freelance design work. AWAY was your Master’s thesis at the School of Visual Arts in NYC. 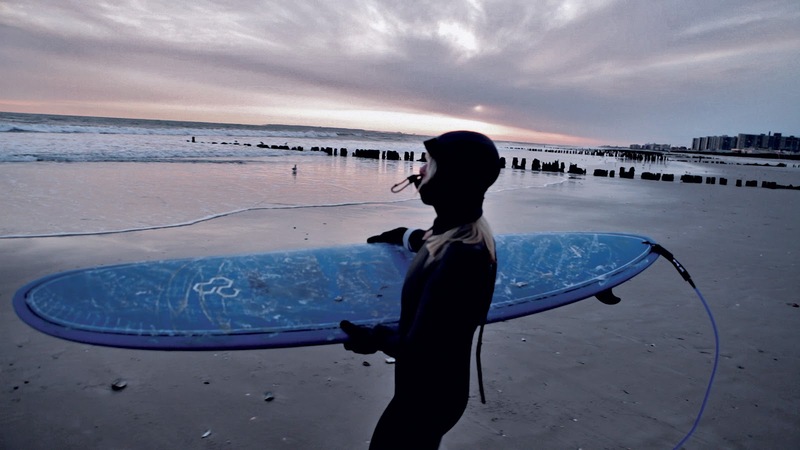 What inspired you to create a film about women’s surfing at Rockaway? 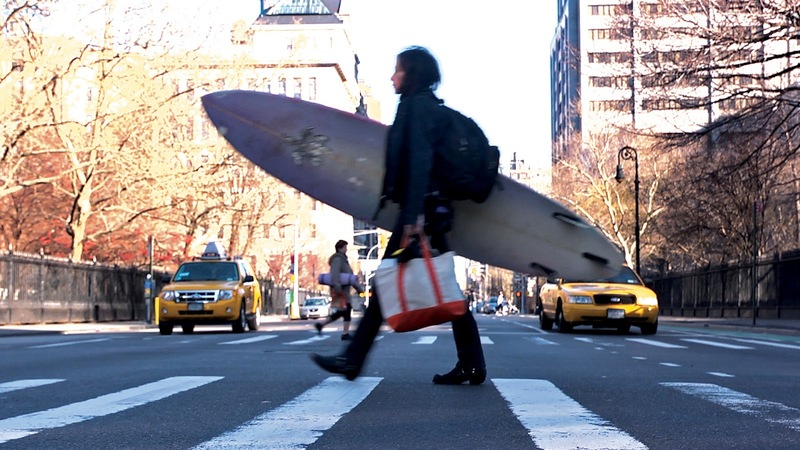 It’s no secret that in the past few years, there has been somewhat of an explosion in the popularity of surfing in NYC. What caught my attention and what drove the idea behind the film was how many more women there were surfing and excelling in this male-dominated sport at Rockaway Beach, an unexpected, moderately difficult, inconsistent break inside NYC. I understand the level of commitment necessary to be a serious NYC surfer and also the difficulty and frustration. There were a few documentaries and lots of press coverage that focus on the men who surf at Rockaway, but I couldn’t find much about local NYC female surfers. I even read an article that talked about the Rockaway surf scene and its history that stated “The story of Rockaway’s women of surfing has yet to be told.” That was my “aha” moment. I think what I’ve ended up with is a film that takes a personal look at three women who collectively represent an archetype of what it is to be a female NYC surfer. How did you come across Katrina, Mary, and Jee Mee, the three subjects of your film? Mostly through word of mouth, either through friends, friends of friends, or the kindness of total strangers. Katrina, is actually an old friend of my husband’s who he recently re-connected with and found out that she surfed at Rockaway. The other two, Mary and Jee Mee, I found through talking to people within the Rockaway community. I have to mention that everyone who I encountered during the whole process of making this film was so very kind, helpful, and accommodating. I can’t say enough great things about the Rockaway community as a whole. What was your reaction when the film was being screened at the NY Surf Film Festival on Wednesday, Sept.19? It was just incredible to see it on a big screen and in front of an audience. So exciting. And to just be a part of the NY Surf Film Festival and have my film shown alongside all those other fantastic surf films was pretty cool and a great experience. What was the production schedule for the film like? It was a fairly rigorous schedule because of the imposed school deadline of a finished film by mid-April. I started looking for and meeting with potential characters, women who surfed at Rockaway, last November. Around the same time, I also started looking for DP’s. I had my three female surfers and two brilliant DP’s in place just before Christmas and started shooting right after Christmas. The month was filled with getting to know my characters, interviewing potential editors, fitting in shoot days where possible, all the while attending my required classes. I’d say shooting was initially wrapped by mid-February and I saw the first rough cut in the beginning of March. I was sort of panicked because we needed more surfing footage and conditions had been so bad all winter but the planets happened to align one Sunday and we were able to get what we needed. Then it was all about getting the edit right and getting the music right. I was fortunate to have found a super talented young editor and a super talented accomplished musician/composer to bring the film together. And I did the graphics myself. What where your major challenges while creating the film? The whole thing was a huge challenge! I’d never made a film before. But more specifically, lack of money, of course was a challenge, as it is with most documentary films. 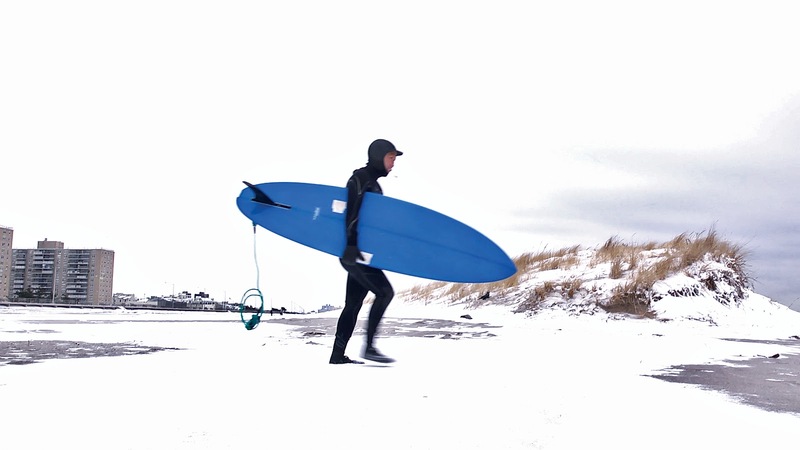 And even more challenging was getting good surf footage last winter. It was a pretty warm winter and not many storms so good surf days were limited. And on top of coordinating with Mother Nature, I had to coordinate around the work schedules of all those involved. Plus, add in the fact that the film had to be done by mid-April for school. It was a huge challenge but somehow it all worked out. Are you looking to enter the film into other film festivals? Yes, definitely! I’ve already entered it in SXSW, the Newport Beach Film Festival, the Queens World Film Festival, Slamdance and Sundance (why not? ), and I’m also planning on submitting it to a bunch of others in the coming months. When we spoke, you mentioned opening a production studio of some kind with your husband. Are you looking to create more surf films or experiment in other genres? The studio that I’m opening with my husband, who is a freelance illustrator, is more of a creative studio that specializes in design/art direction, illustration and motion/video. We’re essentially combining our talents to make something bigger than what each of us can offer alone. We’re currently in the process of creating our identity: working on our logo, website and a reel. And while making films wouldn’t necessarily be our main emphasis, I would absolutely love to make another film, surf or some other topic. I’m also interested in making my short doc into a feature length film. I think there’s a lot of material to work with and much of the feedback I get from those who have seen it is that they want to know more. Thank you, Elisa for taking the time to speak with us and giving us a glimpse into the creative process behind AWAY. You can view the trailer below. Keep an eye for the feature length version too. Can’t wait to see it! AWAY Teaser Trailer from Elisa Bates on Vimeo. AWAY is a short documentary film that looks at the subculture of NYC surfing through the lens of three women that surf at Rockaway Beach. Sign up on awayfilm.com for info on upcoming screenings and/or events. Other questions? Contact: elisa@awayfilm.com. Directed by Elisa Bates; Cinematography by Dan Hedges and David Sosnow; GoPro Camera footage by: George Bates: Edited by Stephanie Gould and Elisa Bates; Music by Sean Eden; Sound Mix by Jeff Seelye.